LIGHT GREY ART LAB: Your fate is in our hands! Your fate is in our hands! We're about a month away from the Tarot, Mystics and the Occult show and we are SUPER excited. So excited, in fact, that we'll be doing something special to get everyone in the mood. We are looking to select three brave individuals to let us read your Tarot on a LIVE online broadcast. If you've ever wanted to have your Tarot read, and are daring enough to try, just post your name and email below and we'll randomly pick three people to have a full Celtic Cross reading with us! Here's the fun part! 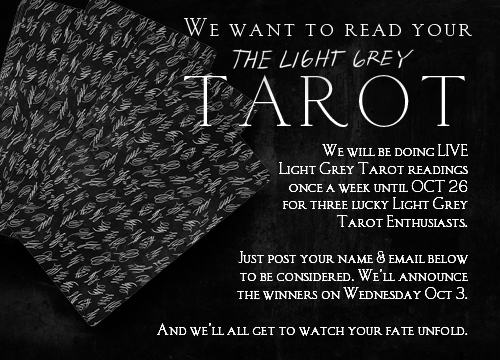 Even if you're not chosen, we'll post the videos online for everyone to see and you'll get a sneak-peek of the art, the deck, and an idea of how the Light Grey Tarot works! We're super excited to do this so, please, help us spread the word! The drawing ends at midnight on Tuesday Oct 2, and we'll be choosing and announcing the three lucky people on Wednesday, October 3. We'll post the winners along with the dates for when you can tune in and watch the readings happen in real time! Good luck and may the fates smile upon you! Don't forget that the official opening of the Tarot, Mystics and the Occult show is October 19th and the reception is on October 26th at Light Grey! If you're not chosen for the live reading, you'll have another chance to get a three card reading at the reception on the 26th. We'll keep you posted as it gets closer! I've never had my cards read or even witnessed any cards being read! I'm game! I like to read tarot cards, but readings for myself are always discombobulated. Thanks for the opportunity. Download Redbox TV for PC Using android Emulator. Redbox TV as you know is a streaming app which lets you stream live TV channels in just a few clicks. The app is an open source means you can use it for free, you don't need to buy any subscription or membership to enjoy the features of the app.